A classic on the move snack, spring rolls are those you can just munch away at. Minced vegetables wrapped in a pancake of wheat flour, assist you imbibe the nutrients of fresh veggies and fill the tummy up with happiness. Keeping in sync with the latest market norms and policies, we are indulged in providing a high quality range of Frozen Veg Spring Roll. Pastry: Refined wheat flour, Water, Partially hydrogenated vegetable oil, Edible vegetable Deep fry frozen “Al Kabeer Veg Spring Rolls on medium heat (180 for 3-5 minutes or until golden brown. Drain and serve hot. Due to our years of expertise in this realm, we are presenting an exceptional quality variety of Frozen Spring Rolls. 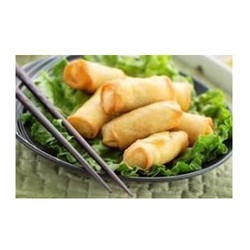 Offered by us is a wide assortment of veg spring rolls. These frozen veg spring rolls are a crunchy wrap filled with delicious fresh vegetables. To meet the various requirements of the customers, we are involved in offering a wide assortment of Veg Spring Roll.